Very recently, we’ve had an abundant amount of issues around environments using unconstrained delegations failing. What is unconstrained delegations you might ask? 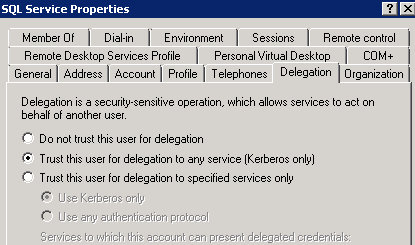 It’s what we call “Full Trust” delegations, and my former Escalation Engineer nicely details the differences between constrained delegations and unconstrained delegations in his post My Kerberos Checklist. 1. We’ve failed to login to Report Server with Kerberos, hence failed to NTLM. 2. The Report Server Service Account is not able to delegate to the back-end service, and/or the back-end service does not have an SPN. The auth_scheme column will tell you whether you are connected via NTLM or Kerberos. Since we know that both Reporting Service and SQL Server is connectable with Kerberos, the only explanation is that Reporting Services was not able to delegate to SQL. We turned on Kerberos Event Logging and took Kerberos ETW traces. Kerberos Event Logging shows the error, “KDC_ERR_BADOPTION”. This represents a constrained delegation error, which is odd because our environment is setup for unconstrained “Full Trust” delegations. Furthermore, looking at the Kerberos ETW traces, we are seeing S4U2Proxy being called. This means that Reporting Services is trying to call constrained delegations to the KDC, but we’re obviously going to fail because we’re not setup for constrained delegations. So what was breaking our Kerberos configuration? 2. Configure constrained delegations for Reporting Services.